This posting is a continuation of our previous posting “Part 2 – C60/Caulfield Village Development Plans – Why you can & should object – Traffic”. If you haven’t already done so, GERA recommends reading this posting in conjunction with our earlier C60/ Caulfield Village Development Plans postings. 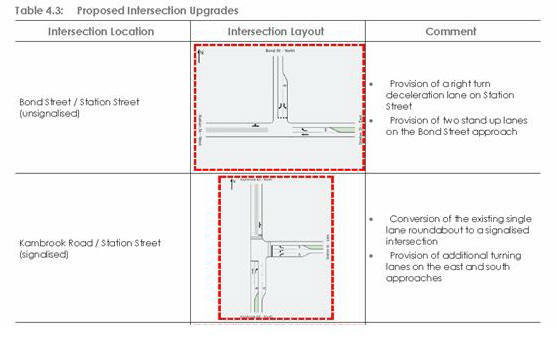 • Infrastructure changes – The Integrated Transport Plan, under the S173 agreement*, proposes the following infrastructure changes to the existing, analysed road next work. These modifications will be undertaken as appropriate for each stage of the Development (eg. 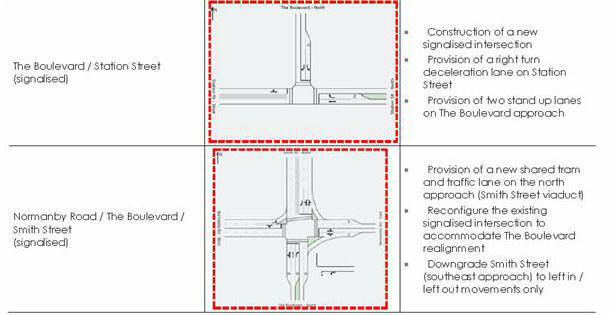 signalisation of the Kambrook Road/Station Street intersection will occur during the Stage 2 construction phase). • Inadequate consideration given to displaced parking in Smith Street, Station Street and ‘the triangle’ on weekdays or during Racecourse events. Displaced parking arising not only from road configurations but also by the introduction of time restricted parking within the development have not been considered. • No consideration given to the parking impact of the Monash University development on the C60 development or surrounding residential areas. • No consideration given to the “Triangle” displaced parking (shared by Monash University staff and Tabaret (“Glasshouse”) patrons. Council has long recognised that on street parking demand in the local area exceeds demand, particularly during weekdays and racecourse events. • The weekday demand for parking is predominantly due to the proximity of Caulfield Station and commuters seeking on street, paid all day parking (Smith Street, Station Street, and Normanby Road) or unpaid on street all day parking in residential streets. Parking demand arising from Monash University primarily arises from students and is directed to residential streets. o Off Street – by the Centre of the Racecourse (3000 free public parking accessed by the Glen Eira/Booran Road Tunnel), Members Carparks 1 & 2 (not available post development), the Guineas Carpark (536 space – crown land) and the Kambrook Road (674 spaces – MRC free hold land). In total existing carparking will decrease 5646 spaces to 4210 spaces post development..
o On-street – along the main roads (Smith and Station Streets, Kambrook and Normanby Roads) and surrounding residential streets. • 165 current of on-street/off site car parking spaces will be lost due to the reconfiguration of Smith and Station Streets and lower on-street/off site parking provisions in the Boulevard. • Of the expected 18,900 vpd traffic generated by the Development, 8,500 is attributed to residents (presumably accessing or exiting the development) and 10,400 vpd is attributed to retail. Even allowing for the short term, high turnover requirements of retail parking on street parking provisions are inadequate. • within the development, public open space needs are provided solely by linear, landscaped access paths (some shared with vehicle garage access) which are said to foster a “vibrant community”. However, residents have indicated that the proposed landscaping provides for small, sparse canopy trees that will have difficulty surviving in soil depths limited by basement car parking and locations between multi-storey buildings that restrict access to sunlight and rainfall. In addition residents suggest that linear parks are generally seen as serving little civic purpose or function as they are more suited to movement than congregation. • In general little mention has been made of parks within the surrounding area (Centre of the Racecourse, Caulfield Park, East Caulfield Reserve), while that mentioned focuses on “already at capacity” Caulfield Park. Yet, the Centre of the Racecourse closer to the development and is within easy walking distance of any point within the development. Additionally, improved pedestrian connectivity to East Caulfield Reserve has been overlooked. Several of our members with knowledge of drainage (GERA does not profess to be drainage experts) have expressed concerns on the storm water drainage provisions outlined in Development Plan documentation. Their concerns arise from a 90% impermeable site coverage (previously 100% permeable), the increasing frequency of extreme weather events and a natural land slope that will direct surface run off towards Caulfield Park. While Council is currently undertaking drainage works in the nearby residential streets (presumably to service the drainage requirements of the C60/Caulfield Village Development), our members are also concerned that, as in the last extreme weather event, increased storm water flows where Council drains connect with Melbourne/South East Water drains may result is flooding in areas removed for the actual development site. • that the above two points places a responsibility on all levels of government to adequately provide those sustainable transport options. Unfortunately, the development of, or improvements to the most expensive (and perhaps most effective) sustainable transport options – public transport – are lacking. Without service and capacity improvements to the current inadequate, stretched to capacity public transport network, developments of the magnitude of C60/Caulfield Village do more to encourage the use of private vehicle transport than it does to encourage the use of public transport. For this reason GERA believes that C60/Caulfield Village proposal should be delayed until public transport infrastructure improvements are at least in the pipeline. Council MAY accept late submissions and if so, given the limited time frame, we encourage sending submissions via email. A submission does not have to lengthy and it does not require your attendance at the Planning Conference. However, it does place your submission on record and ensures that Council will inform you of it’s decision. Residents who have not made a submission may still attend the Planning Conference. Broadly, a Section 173 Agreement is a legal agreement (under Section 173 of the Planning and Environment Act 1987) between the Local Authority (Council) and the owners of the land (the MRC in this instance). S173 agreements are generally used to reinforce planning controls and impose restrictions and conditions on titles. Please note GERA advises that a number of our members reside in the vicinity of the C60 / Caulfield Village Development – the number of these members is less 0.5% of the 500 local residents that Council has identified, and contacted, as those most likely to be impacted by the development. This percentage falls further when the development’s flow on impacts to the broader community are considered. With regards setbacks, residents/readers should be aware that above Planning Scheme Amendment C111 was presented to Council for review at the 15th October, 2013 meeting. The Minister was seeking Councils view on a proposed Ministerial Amendment requested by the developer. As described in the officer’s report (Council Minutes 15/10/2013) the amendment sought “to make some changes to provide increased clarification to the documentation associated with the Caulfield Village Development”. • Point 2 – “An ability to allow minor building works such as verandahs, balconies, eaves, downpipes, street furniture and art works to intrude into stipulated setback requirements”. While perhaps of limited relevance to the current Stage 1 Residential Development Plan consultation will presumably be significant (access to natural light) in the later Stage 2 (Mixed Use Precinct) and Stage 3 (Smith Street Precinct) consultations. o the elements of “certainty” said to be included in the Incorporated Plan. o the DPCD practice note discussion above – “The responsible authority should not grant a permit for use or development that is not generally in accordance’ with the plan unless the schedule provides a clear basis to do so”. Although the report states that the first of the development plans was “expected to be submitted to Council shortly” and that Council was “not in a position to abandon the amendment” it could “provide a view”, it is surprising that the possibility of including the amendment details in the Development Plan consultation or of proposing modifications to the proposed amended were not discussed as options in the Officer’s Report or raised by Councillors in the ensuing discussion. The recommendation included in the officer’s report was passed unanimously. Amendment C111 was enacted on 14/1/2014 (Development Plan consultation commenced 5/2/2014) and has been included in Caulfield Village Mixed Use Area Incorporated Plan dated December, 2013. • The December, 2013 Incorporated Plan is now referenced in the Planning Scheme and hence will be the Incorporated Plan applicable to all current and future “generally in accordance” discussions. The change is identified as being related to Amendment C111 on 14/1/2014. • Both the November and December, 2013 Incorporated Plans shows no height restrictions on the “Triangle” building site currently used for Tabaret and Monash University car parking. The height restrictions are defined as “Height and form to be assessed on design merit” (previous height limits were 2008 = 15 storeys, 2011 = 20 storeys). Without a defined height limit there is no way to determine if the height limit has been exceeded – it removes the “trigger” that identifies when a planning permit is required and thereby the reinstatement of third party objection rights. Since no details have been provided on the removal of these height restrictions (this particular building was a highly contentious issue at all C60/Caulfield Village consultations due to its proximity to the heritage listed Caulfield Station), GERA is unable to confirm when the height restrictions were removed and whether their removal was a ministerial decision (with or without review by Council). As previously mentioned in our earlier “Overview” posting (insert link) residents have consistently raised issues with the inadequate traffic analysis. All previous and current Development Plan traffic analyses focussed on traffic within the development itself and on the sections of the main roads that were “in the vicinity of the site”. No analysis was undertaken on the impact on surrounding residential streets or Neerim Road or Queens Avenue or the Normanby Road underpass and potential flow on impacts from the Monash University development were not considered. The estimated post construction traffic generation from Caulfield Village is 18,900 vpd. Information on the dispersement the Caulfield Village generated traffic is scant as are traffic volumes for the Boulevard (which will be greatly impacted by the reconfiguration works in Smith and Station Street). Local residents’ empirical evidence indicates that the current volume of traffic is primarily due to through traffic skirting railway level crossings via the Normanby Road, Smith Street and Queens Avenue underpasses. The current absence of retail or commercial services/employment opportunities in the defined area adds considerable weight to the residents evidence. Since traffic is highly fluid, residents believe that increased congestion arising from the development (construction and post construction periods) will flow on to other areas of the municipality. Details of these studies, although relevant to the Development Plan Consultation and in part addressing the inadequacies of previous traffic analyses, have not been made available as part of the Development Plan Consultation. Since the roads identified in the above recently undertaken Council traffic studies (ie. Queens Avenue, Eskdale Road, Neerim Road) are those that residents have consistently argued should have been included in all traffic studies undertaken for the development, residents are now left questioning why they were not included and to what extent the costs of the currently unknown infrastructure works will be funded by the Glen Eira ratepayers. GERA agrees with the residents questioning. Please note GERA advises that a number of our members reside in the vicinity of the C60 / Caulfield Village Development – the number of these members is less than 1% of our members and less than 0.5% of the 500 local residents that Council has identified, and contacted, as those most likely to be impacted by the development. These percentage falls further when the development’s flow on impacts to the broader community are considered. In a previous posting which provided an overview of the C60 / Caulfield Village (Overview Posting) raised many governance issues related to Council’s 2011 decision to approve the C60/Caulfield Village Incorporated Plan. Unfortunately this posting will add more to those governance issues. • An Incorporated Plan is generally a broad outline of a large development proposal which sets the basis for the proposed future development of a site. Once approved, it defines the approved siting of buildings within the proposed site and the prescribed building envelopes (ie. the building’s footprint, height and setback requirements). In large sites, such as C60/Caulfield Village (5.5 – 7.7 ha), it can also stipulate land uses (eg. residential vs commercial vs retail) and access networks (eg. roads and pathways for vehicles, pedestrians and cyclists) within the site. The Incorporated Plan is not required to include detailed plans – it is more a “conceptual or overview” that the Community Engagement Documentation (also known as 17th December, 2013 Council Meeting Minutes extract) states adds “certainty” to the proposed developments building envelopes. • “guidelines” for later preparation of the detailed/development plans. Development Plans should conform to the Incorporated Plan, however, practicalities being what they are, some divergence between the two Plans (Incorporated vs Development) is permitted provided that the Development Plan is “generally in accordance” with the Incorporated Plan. is a statement of opinion rather than fact. The term “generally in accordance” is open to interpretation and residents and objectors have a right to express their views on what it means. Development Plans found to be “NOT generally in accordance” can be rejected and the planning permit approval process is required to be re-started (back to square one). o Display the development plan for public comment …. o Consider any comments received in response to the display of the development plan”. While Council’s and residents’ definition of “consider” frequently differ, it is widely accepted that Development Plan consultation can and should include comments related to Incorporated vs Development Plan differences and that those differences (both individually and cumulatively) must be considered before a decision is made on what is or is not “generally in accordance” in any Development Plan consultation. This, plus the inclusion of the “before” requirement in the planning scheme schedule specifically related to the Caulfield Village Development, raises serious governance issues concerning the above mentioned content of the advertisement and letter authorised by Council and Council’s Strategic Planning Department. Resident should note that as per the Department of Planning and Community Developments (DPCD) practice note, that approval of Development Plan applications which are “generally in accordance” with the (Incorporated) plan should NOT be automatically “granted if other relevant planning policies or considerations indicate that it should be refused”. • All Development Plan “planning permits granted by the responsible authority must be ‘generally in accordance’ with the plan. To fulfil this requirement, the responsible authority must test each proposal against the use and development requirements of the plan. If it takes the view that a substantial provision of the plan has not been met, a planning permit cannot be granted . … The responsible authority should not grant a permit for use or development that is not generally in accordance’ with the plan unless the schedule provides a clear basis to do so”. Refer Glen Eira Planning Scheme extracts – Development Plan Requirements and Development Plan Decision Guidelines for additional information on the Development Plan components that Council should take into account and test when considering the submitted Development Plan. GERA suggests that the Development Plans do not support the vision that the development will result in a “village centre and walkable neighbourhood, where you can live, work, shop and relax”. The contentious 2008 proposal tended to support this vision by proposing a smaller scale development comprising 1,000- 1200 dwellings of diverse types (eg. townhouse, 1, 2 or 3 bdr units), and 35,000 sqm of retail and commercial space. The Development Plans provide for a substantial increase in the number of dwellings (2046 – of which 1687 are 1-2 bedroom units) and a substantial decrease in employment opportunities (15,000 sqm of retail and commercial space which includes a 4,000 sqm supermarket). In addition the Development Plans do not show an increase in publicly available open space within the site that is commensurate with the expected population increase. Please note GERA advises that a number of our members reside in the vicinity of the C60 / Caulfield Village Development – the number of these members is less than 0.5% of the 500 local residents that Council has identified, and contacted, as those most likely to be impacted by the development. That percentage falls further when the flow on impacts to the broader community is considered. To help understand the scale of C60/Caulfield Village Development, a number of readers have requested some visual representation of the proposed development and some assistance with wading through the documentation provided. Residential Precinct – 2 storeys on Kambrook Road, rising to 4-5 set back stories towards the higher density Mixed Use Precinct. To comprise 442 dwellings. Mixed Use Precinct – 4-5 storeys, rising to 8 set back storeys towards the higher density Smith Street Precinct. To comprise 732 dwellings, 4000 sqm. Supermarket and 3658 sqm retail space. 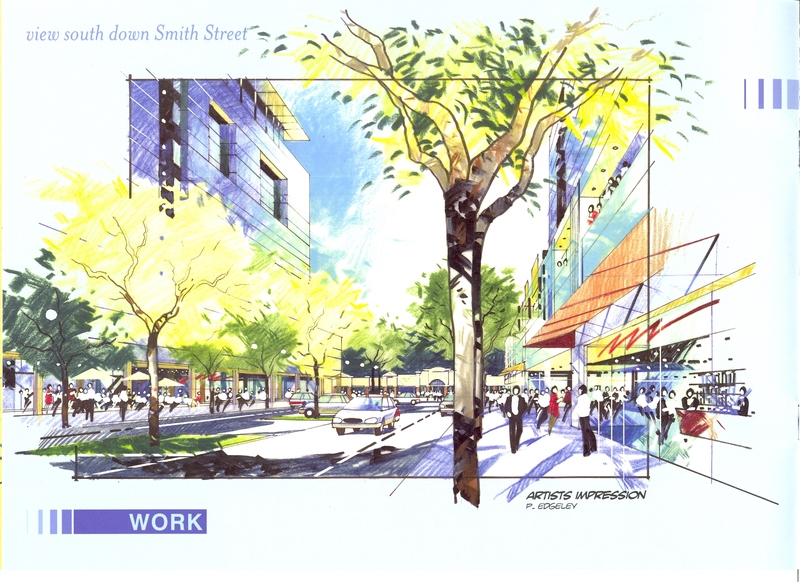 Smith Street Precinct – comprising 872 dwellings and 5838 sqm retail space. The following is a listing of all Development Plan Documentation available on Council’s website under the heading links shown below. All documents are PDF files – Council’s website indicates the size of each file. The documents highlighted in red related to the entire (whole) development, while the black documents specifically relate to the Residential Precinct. The documents related to the entire (whole) development are a reasonable starting point for submission preparation (due date 26th February, 2014). Information contained in these documents may be clarified or supplemented by information provided in the related Residential Precinct Documents. GERA recommends that residents review all the below documents (a big task we know) prior to attending the scheduled Planning Conference – 6.30 pm, 3rd March, 2014 at the Caulfield Park Pavilion. Posting updated 25/2/2014 to include precinct heights and composition. GERA has received a number of emails from residents asking for information on the C60 / Caulfield Village Development – where is it, what is it and what’s the C60 planning approval history. In response, this posting focuses on providing an overview of the original proposal and current Incorporated Plan and the governance issues that arise from Council’s C60/Caulfield Village approval process. Subsequent posts will discuss the current Development Plan. 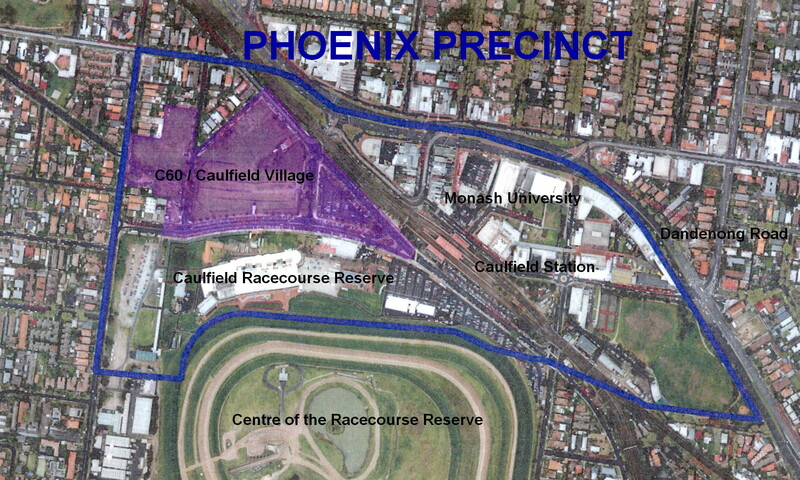 The C60/Caulfield Village Development is located within what is known as the Phoenix Precinct which was designated as a Priority Development Zone (Major Activity Centre) in the 2002 Planning Scheme Review and that also identified the Housing Diversity/Minimal Change Areas across the Glen Eira Municipality. The Phoenix Precinct includes two major sites separated by the divisive railway line. Road connectivity within the precincts is limited (Smith Street and Queens Avenue underpasses) and pedestrian unfriendly. Pedestrian connectivity is provided by the Caulfield Station pedestrian only underpass. • Monash University – in the western precinct. The Monash site is bounded by Dandenong Road, Derby Road (part), Sir John Monash Drive and the Campus Green of Monash University Caulfield Campus. The proposed Monash University development (originally comprising several 23 storey buildings) was delayed due to reduced government funding (arising from the GFC) and the withdrawal of the development partner/manager/contractor (Equiset), Current reports indicate that the development will comprise the addition of 10 to 12 storey buildings across the campus area. The addition of 2 storeys (currently a work in progress) to an existing Dandenong Road building, indicates that some expansion is already occurring. 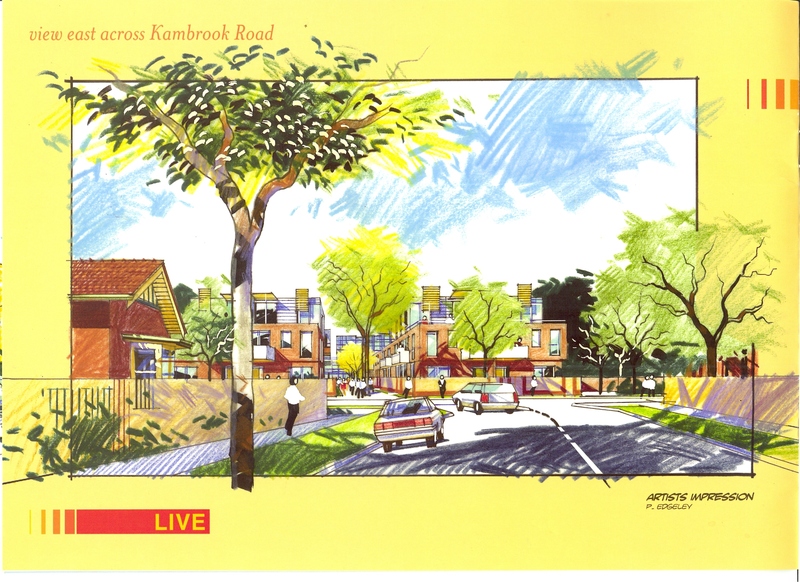 • The MRC C60 / Caulfield Village Development, now known as the “Caulfield Mixed Use Area” in the Planning Scheme. This is MRC freehold land south of the railway line and north of the Caulfield Race Course Reserve and is generally bordered by Station Street, Kambrook Road, Balaclava Road, and Normanby Road. except for the asphalted triangle* of land at the Caulfield Station end, which is currently used for Glasshouse Tabaret and Monash University car parking, the C60 site was not crown land. The Caulfield Racecourse Reserve (which comprises the majority of the Racecourse site) is crown land designated as having three separate yet equal purposes: racecourse, public park and public recreation area. It is this designation that gives rise to the frequent, contentious Centre of the Racecourse Reserve issues – the principal argument being that the racecourse purpose is well served but the public park and public recreation purposes are not. 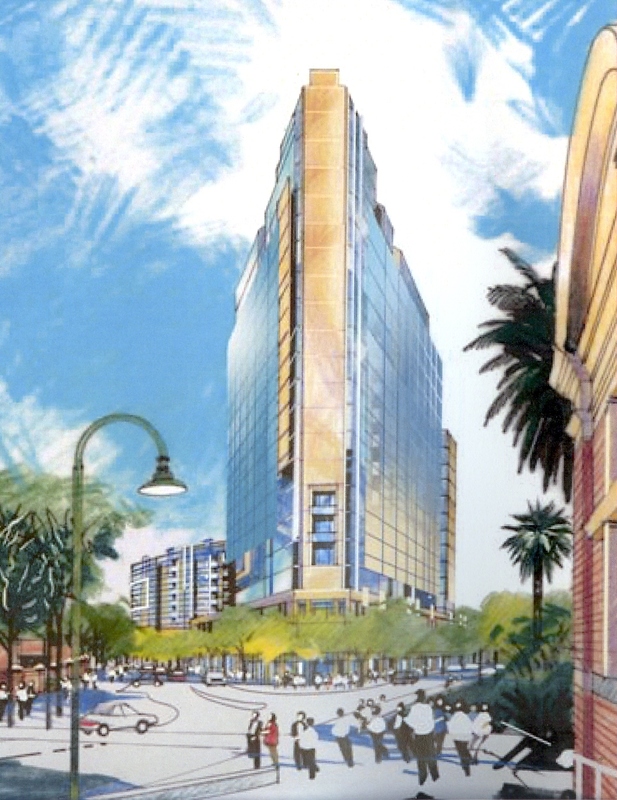 the development proposed is named “Caulfield Village”. 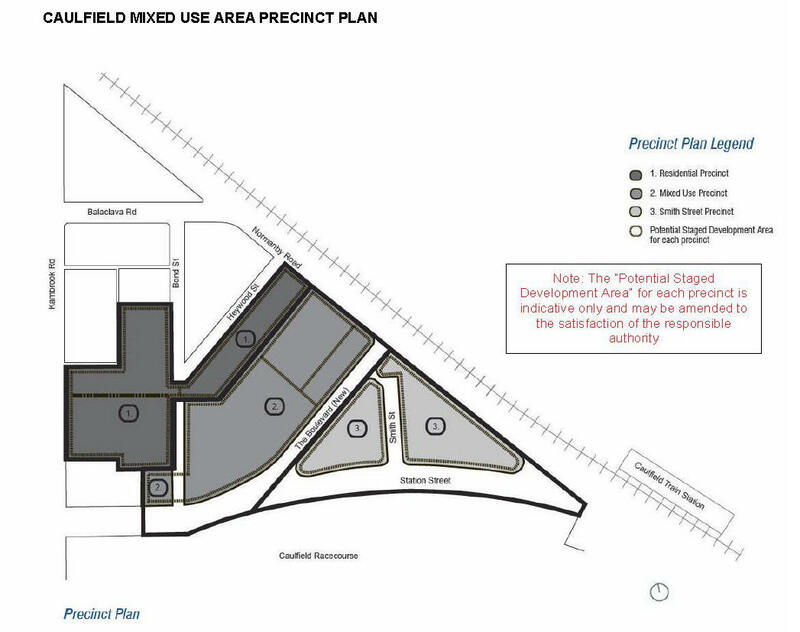 Planning Scheme Amendment C60 was introduced to rezone the actual site within the Phoenix Precinct to a Priority Development Zone and the “Caulfield Village” development to proceed. Hence the two, frequently interchangeable, terms. Both the current development plan and original proposal divide the site into 3 precincts with the precincts being developed in stages. 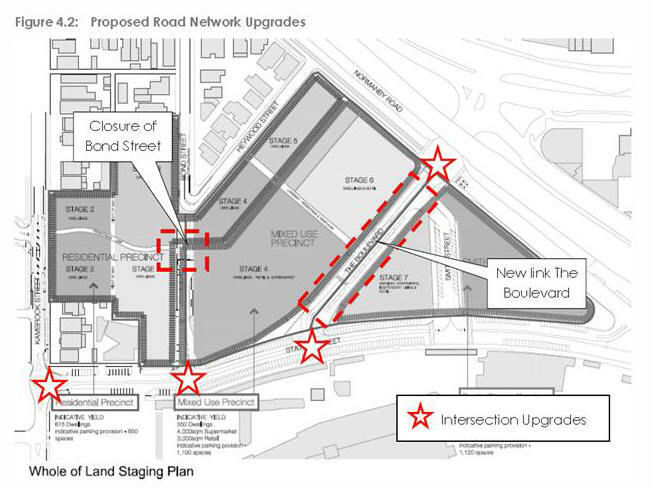 To improve access within the site, a new road “The Boulevard” (connecting the Smith Street Underpass to Station Street) will be constructed, Smith Street will be reconfigured (restricted access near the underpass) and Station Street angled parking will be replaced with parallel parking. • Mixed Use Precinct – Contemporary style buildings up to 3 stories on street fronts, rising to 5 set back stories towards the higher density Smith Street Precinct. Estimated no. of dwellings was 340, with no information on set backs and no details on no of bedrooms. The apartments were to be located above 7,550 sqm of retail and commercial space (no detail given on retail/commercial split). o a 15 storey building across from Caulfield Station which comprised 5,000 sqm of retail space on lower levels and 20,000 sqm of commercial/office space. As per the Residential and Mixed Use Precincts limited information on setbacks was provided and no details were provided on apartment types (eg. no. of bedrooms). “Caulfield Village is a large-scale development project located to the north of the Caulfield Racecourse on free hold land. Upon completion in the next ten to fifteen years, Caulfield Village will contain 1200 dwellings (ranging from apartments to short-stay accommodation), 15000 sqm of retail floor space (including a supermarket) and 20,000 sqm of commercial office space”. 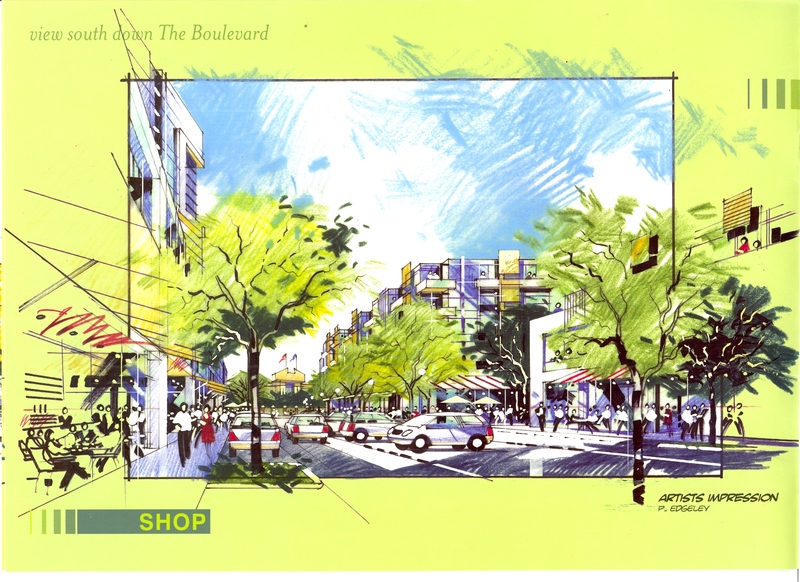 Promotional material for the development described it as “a village centre and walkable neighbourhood, where you can live, work, shop and relax”. Residents, involved in the C60 consultations and aware of Councils decision making process, have raised a number of issues related to governance and the principles of good governance (refer GERA’s 8/12/2011 Governance posting) throughout the consultation process. For various reasons, Council appointed a four member (Crs. Esakoff, Hyams, Lipshutz and Pilling) Racecourse Special Committee which, together with CEO Andrew Newton, was to oversee and conduct negotiations with the MRC and implement the community consultation process. CEO Newton and Cr. Esakoff were appointed as the chief negotiators. The Racecourse Special Committee recommended approval of the C60 Amendment and Incorporated Plan. This approval recommendation was presented to, and ratified by, Council on the 28th April, 2011. As a result of this ratification the Minister for Planning (rather than Council) become responsible for all future planning decisions related to the Caulfield Village and residents third party objection rights were removed. While GERA has no knowledge of any Racecourse Special Committee reports presented to Councillors at Meetings of Assembly (ie. in-camera briefing sessions), residents have advised that no such reports (or report summaries) were presented to any open Council Meeting and residents/objectors were not kept advised on an ongoing basis. • 8th February, 2010 – Planning Conference. Estimated attendance estimated at 50+. • 4th April, 2011 – Planning Conference. Estimated attendance 150+. • Inadequate traffic and parking analysis which focussed on traffic within the development itself and on the sections of the main roads that were “in the vicinity of the site”. No analysis was undertaken on the impact on surrounding residential streets or Neerim Road or Queens Avenue. • Inadequate consideration given to displaced parking in Smith Street, Station Street and ‘the triangle’ on weekdays or during Racecourse events (be they special, eg Spring Racing Carnival or the Caravan and Camping Show or standard race days). Displaced parking arising not only from road configurations but also by the introduction of time restricted parking within the development not considered. • No consideration given to the impact of the Monash University development on the C60 development or surrounding residential areas. Residents have also advised that at both the February, 2010 Planning Conference and the May, 2010 Independent Planning Panel Hearing, all documentation and expert witness reports (including Councils traffic and parking analysis) related to the development comprising 1200 dwellings and 35,000 sqm retail/commercial space as per the 2008 Caulfield Village Incorporated Plan. The relevance of the 2008 Incorporated Plan to the Independent Planning Panel Hearing is confirmed in the March, 2010 Department of Planning and Community Development letter, which advises objectors of the panels appointment. While a potential increase in building heights, dwellings numbers and retail/commercial space was mentioned at the Independent Planning Panel Hearing little or no detail was provided on the potential increases and no expert witness documentation was presented that supported the potential increases. Independent Planning Panel Report, 2010. At the 4th April, 2011, Planning Conference (Chaired by Cr. Lipshutz and attended by Cr. Pilling, Hyams, Esakoff) the MRC made a brief verbal presentation (with the aid of a scaled model) outlining the height increases. Reportedly, this was the first time residents were informed of the height increases and the provision of 2000 on site/off street parking spaces (a figure which basic Rescode rates indicates is inadequate for the estimated of 1200 dwellings and the number of employees and patrons required to ensure a viable 35,000 sqm of commercial and retail space). No documentation was presented, either prior to, at or after the meeting, which related to the height increase, space usages or analysis of the impact of the development on the above key issues raised by residents/objectors. Approximately 3 weeks later, on 28th April, 2011, although neither the “amended” Incorporated Plan (with height increases) or the associated Section 173 Agreement** had been presented for community consultation Council ratified the Incorporated Plan. 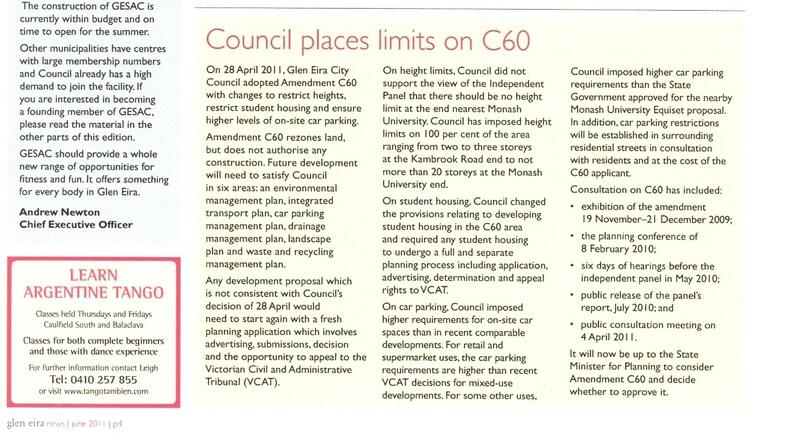 As per Council’s Press Release (Glen Eira News – June 2011 – page 4) building height limits had been imposed and the originally proposed car parking requirements had been increased. Details of the actual height limits and the car parking provisions were not given. • Smith Street Precinct – 4 storeys at street front, rising to 12 facing the new Boulevard, 4 storeys at street front, rising to 20 on the Normanby Road/Station Street/Smith Street Triangle. Was three buildings of 10, 12 and 15 storey building. The Incorporated Plan now describes the 1200 dwellings, 15,000 sqm retail and the 20,000 commercial proposition as “a tested development scenario”. The above outline gives rise to a multitude of governance issues (refer GERA posting 8/12/2011 “Governance”) and indicates that the principles of “good governance” were not applied during the above consultation process. Residents involved in the above consultation process dispute Council’s claims that it undertook “a rigourous community consultation and amendment process” that showed “respect” and that “the community’s involvement in ‘helping shape the future of the area’ has occurred”. “Good governance” and genuine community consultation requires the disclosure of information and an informed community. GERA is not questioning the legality of the Council’s C60/Caulfield Village decision making processes. However, GERA believes that it is appropriate to question how well Council, within the bounds of legality, represented the community it serves both within the local and broader community context. This precept is fundamental to the role and functioning of Local Government. * The Triangle was the subject of a contentious land swap agreement between the State Government and the MRC/Trustees. ** Broadly, a Section 173 Agreement is a legal agreement (under Section 173 of the Planning and Environment Act 1987) between the Local Authority (Council) and the owners of the land (the MRC in this instance). S173 agreements are generally used to reinforce planning controls and impose restrictions and conditions on titles. Please note GERA advises that a number of our members reside in the vicinity of the C60 / Caulfield Village Development – the number of these members is less than 0.5% of the 500 local residents that Council has identified, and contacted, as those most likely to be impacted by the development. That percentage falls further when the flow on impacts to the broader community is considered, ie. vehicular traffic is highly fluid, traffic congestion and parking constraints will result in alternative routes and parking options being sought within the municipality. Obviously GERA is concerned about impacts within the local area, however, the flow on impacts to the broader community is equally concerning. Erratum – 23/2/2014. The listing of Crs. appointed to the Racecourse Special Committee inadvertently omitted Cr. Pilling. This has now been corrected.